Kensington District in London - What to Expect ? The charm of Kensington’s historic architecture and soothing green spaces just a short journey from central London make this locale your perfect place to stay while in the city. Knightsbridge, Notting Hill, and Holland Park are all quickly accessed, and within close distance from high street. Wanting chic and cheap hotels or b&b’s just a short journey from London’s centre? 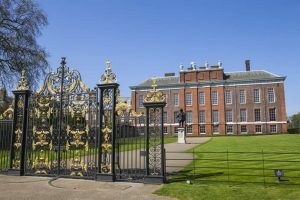 The stylish Royal Borough of Kensington and Chelsea provides a fine range of options for the budget traveller in the south of the borough. Accommodation for the night with easy access to the tube stations (Hight Street, South and Gloucester road underground station) from the High street means you will be pleased to be staying here. This affluent community holds a treasure-trove of galleries, museums, restaurants and parks for visitors to enjoy during their stay. Major landmarks in the neighbourhood include Kensington Palace, the neo-classical Royal Albert Hall, and Holland Park. Take the opportunity to visit the palace grounds, open to the public from six am daily until early evening. A special interest area is the Italian Gardens, an ornamental water garden found on the north side of the park near Lancaster Gate. The picturesque woodlands and formal gardens of Holland Park are another chance to enjoy the outdoors in London. You can visit the ruins of Holland House, stroll through the orangery, linger in the Japanese Gardens or simply muse in the woods. Breathtaking and magnificent the Royal Albert Concert Hall holds over 350 events annually as well as being a spectacular example of Victorian architecture in the city of London. If shopping is your thing Kensington high street has chain stores and boutiques for the fashion conscious shopper as well as the added bonus of being less crowded than the West End. For museums you can’t pass up the Victoria and Albert Museum popularly referred to as the V&A, the Natural History Museum or the Science Museum. Learn something new at any of these destinations and soak up the knowledge they offer. The Saatchi Gallery is a must see for art lovers for somewhere to while away the time and view international contemporary art at its finest. Kensington is a district in London located on the western side of Westminster. To the north, Kensington is bordered by Notting Hill, to the east, by Brompton and Knightsbridge, to the south, by Chelsea and Earl’s Court, and to the west, by Hammersmith and Shepherd’s Bush. The main shopping street is Kensington High Street, one of western London’s most popular shopping streets. The area boasts many fine London hotels, restaurants and is home to many top London tourist attractions. Several cheap hotel accommodation can be found on Kensington High Street and in surrounding area. A popular hotel in the Kensington district is 3 star rated Grosvenor Kensington Hotel, located near South Kensington Underground station. Area : in west London. The heart of the district is Kensington High Street, the main shopping street. Tube Stations : High Street Kensington, Gloucester Road, South Kensington, Kensington (Olympia), Earl’s Court underground stations. Kensington High Street : shopping street away from the crowds of Oxford Street shopping area. South Kensington : fashionable district surrounded by nice restaurants and beautiful houses. Nice to walk around. Holland Park : nice park west of Kensington Gardens just off Notting Hill Gate. There is a quiet Japanese Garden, typical English gardens, playgrounds for children, etc. Royal Albert Hall (Kensington Gore, London SW7, England (Kensington and Hyde Park)): beautiful and breathtaking concert hall full of history. Natural History Museum (Cromwell Road, South Kensington, London SW7 5BD, England): famous museum for the young and the old with lots of biographical information on famous naturalists. Museum is located in an absolutely spectacular building dating back to 1870. Science Museum (Exhibition Road, London SW7 2DD, England (Bayswater / Notting Hill / Lancaster Gate )): very interesting museum with great exhibitions. Great opportunity to see how technology started. Victoria and Albert Museum (Cromwell Road, South Kensington, London SW7 2RL, England): wonderful museum of art and design. The V&A contains a massive collection from places all over the world.